How does the world's first "levitating turntable" actually work? How does the world's first "levitating turntable" actually work? OK, so it floats… But we had some questions. In 2016, Slovenian company MAG-LEV Audio started a Kickstarter campaign boasting the world’s first “levitating” turntable – a deck that susposedly eliminates the need for a motor, using magnets and an electric current to rotate the platter above the plinth. By the time the campaign ended the following month, MAG-LEV had secured over $500,000 in funding, almost doubling its target. Needless to say, people were hyped. Fast-forward two years, and the MAG-LEV Audio ML1 turntable has finally starting shipping to distributors and Kickstarter backers. While the concept is ambitious enough, and the levitating platter a thing of surreal beauty, the proof would be in the playback. In the intervening development process, MAG-LEV also made a number of changes to the original design, thickening the platter and adding additional protection to stop the magnetic waves inteferring with the cartridge. This cartridge was also mounted to a new tonearm – 9″ carbon fibre tonearm from Pro-Ject – which was also fitted with sensors to lift it from the record at the end of each side. Ultimately though, MAG-LEV say they’re most proud of internal upgrades, which have seen the previously planned Arduino hardware changed for a custom made PCB [printed circuit board] with integrated LED lightning and UPS system. But with such a radical approach to turntable design – one which deviates from the norm more than any deck in recent memory – we had several questions about how this would actually work. We asked MAG-LEV designer and co-founder Klemen Smrtnik to talk us through the mechanics of levitating platters, challenges in the design process and any potential side-effects this new drive system might have. Could you explain the technology behind the MAG-LEV in more detail? How does the platter work? MAG-LEV Audio ML1 turntable is one of a kind. We’ve developed a magnetic coil drive, which means there is no motor driving the turntable, only electricity and magnets. 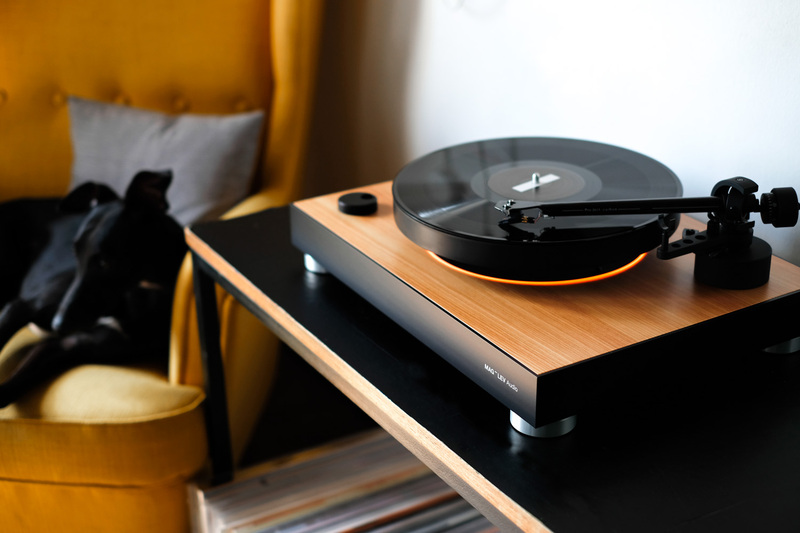 Our patent pending drive, along with the magnetic levitation, makes this turntable special. 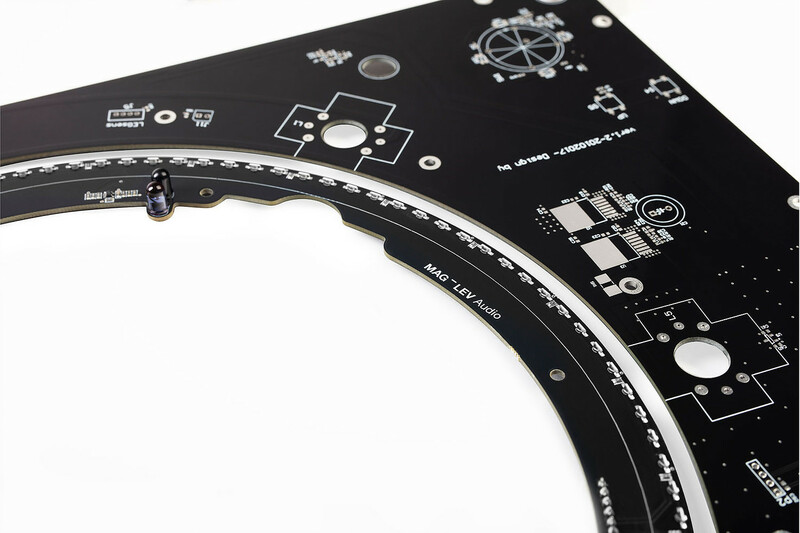 The rotation is regulated through software loaded on a custom-made PCB inside the housing. Sensors read the mirrors on the bottom of the levitating platter and regulate the speed, which can be set to 33 1/3 or 45 rpm. What effect does this have on playback? This effect does not have a major impact on playback, but it does achieve an amazing visual experience. No motor also means there is no wear and tear in regards to the parts of our drive, which results in greater durability. How will it deal with vibration in the room or an uneven surface? In other aspects, the turntable works as any other. It still has to be installed on an even surface and detached from any vibrations to work perfectly. What effect will the magnet have on the tracking force of the cartridge, the stylus, or the tonearm? By isolating the stylus with sheets of blocking material in the platter, placed between the magnets, stylus and tonearm, we’ve managed to eliminate that effect to the extent that it does not have any influence on most MM cartridges. If we develop a second model, we plan to enhance this, so that MC cartridges can also be used. What is the software element and how does that integrate with the mechanism? The software is a fairly complex piece of the puzzle. It takes care of reading signals, adjusting the speed by controlling the power in the coils and takes care of the UPS system and semi-automatic tonearm lift. What challenges did you overcome between the design and manufacturing process? There have been numerous challenges. We have managed to stabilise the platter to the extent that we are getting great audio measurements. The build has come really far, as have the components going into the turntable. Blocking the magnetic field was one of the things we had to take care of first, as this was one of the main challenges to continue moving forward. Going from Arduino technology to a custom PCB was quite a task, as was finding the right sensors that are not interrupted by outside rays of light. Of course, the design has changed due to functionality, but we’ve managed to come out the other side with an even better product that we hoped for. Tough question. Once you come to the end of developing a product, there are numerous things that could have been done differently, but it takes time to come to such conclusions. It’s hard to make the right decision every single time, but I guess the main thing would be, to have more access to testing facilities as we went along, so some issues could have been avoided in advance. But all in all, everything we’ve done has got us to the point where we are proud of the product we have.